Contention motivating this taxonomizing: Research as well as the application of knowledge resulting from research are untroubled by heterogeneity to the extent that populations are well controlled. Such control can only be established and maintained with considerable effort or social infrastructure, which invites attention to possibilities for participation instead of control of human subjects. The taxonomizing is an incomplete work in progress; comments welcome. 8a. In heterogeneous construction researchers establish knowledge and technological reliability through practices that are developed through diverse and often modest practical choices. This is the same as saying they are involved in contingent and on-going mobilizing of diverse materials, tools, people, and other resources into webs of interconnected resources. 10. Participatory restructuring, which occurs in tension with deployment or withholding of trans-local knowledge and resources. 1. Question [P] (or suppress the question [C]) about why this assortment has been collected into one list. 2. In medical sociology Brown & Harris find common meaning despite different types of experience (through coding of sameness despite surface heterogeneity). 4. C: Make people fit types (stereotyping, panopticon, screening & surveillance, public health measures, diagnostic manuals, reassignment surgery…) Control/ignore non-conformers. 6. C: Look for subclasses in which underlying factors are uniform. If found, use to probe or extrapolate (perhaps unsuccessfully) back to other subclasses. Taylor, P. J. (2009). “Infrastructure and Scaffolding: Interpretation and Change of Research Involving Human Genetic Information.” Science as Culture, 18(4):435-459. Taylor, P. J. (2010). “Three puzzles and eight gaps: What heritability studies and critical commentaries have not paid enough attention to.” Biology & Philosophy, 25:1-31. (DOI 10.1007/s10539-009-9174-x). This entry was posted in biomedicine, environmental studies, Sci&TechStudies(STS) and tagged heterogeneity, intersecting_processes, unruly_complexity, variation on February 18, 2011 by Peter J. Taylor. Constructionist and landscape views (Taylor 2005, Chapter 1, Part A) reinforce other currents that have undermined the aspirations of earlier decades for identifying general principles about systems and communities (Kingsland 1995, 213-251; Taylor and Haila 2001). Since the 1980s ecologists in general have become increasingly aware that situations may vary according to historical trajectories that have led to them; that particularities of place and connections among places matter; that time and place is a matter of scales that differ among co-occurring species; that variation among individuals can qualitatively alter the ecological process; that this variation is a result of ongoing differentiation occurring within populations—which are specifically located and inter-connected—and that interactions among the species under study can be artifacts of the indirect effects of other “hidden” species (see Taylor 2005, Chapter1, section B). In patch dynamic studies, for example, the scale and frequency of disturbances that create open “patches” is now emphasized as much as species interactions in the periods between disturbances (Pickett and White 1985). Studies of succession and of the immigration and extinction dynamics for habitat patches pay attention to the particulars of species dispersal and the habitat being colonized, and how these determine successful colonization for different species (Gray et al. 1987). Meta-population theory examines the persistence not of communities but of populations (or phoretic associations of communities on carrier species) in a landscape of patches (Hastings and Harrison 1994). On a larger scale such a shift in focus is supported by biogeographic comparisons which show that continental floras and faunas are not necessarily in equilibrium with the extant environmental conditions (Haila and Järvinen 1990). From a different angle, models that distinguish among individual organisms (in their characteristics and spatial location) have been shown to generate certain observed ecological patterns, such as patterns of change in size distribution of individuals in a population over time, where large scale, aggregated models have not (DeAngelis and Gross 1992). And, the effects mediated through the populations not immediately in focus or unrecognized upset the methodology of observing the direct interactions among populations and confound many principles, such as the competitive exclusion principle, derived on that basis (Taylor 2005,Chapter 1, section B; Wootton 1994). By and large philosophers of ecology, environmental ethicists, environmentalists, and others who invoke principles of ecology have yet to address the implications for their fields of this picture of ecological complexity (Taylor 1997a; Taylor and Haila 2001). DeAngelis, D. L. and L. J. Gross (Eds.) (1992). Populations and Communities: An Individual-based Perspective. New York: Chapman and Hall. Gray, A. J., M. J. Crawley and P. J. Edwards (Eds.) (1987). Colonization, Succession and Stability. 26th Symposium of the British Ecological Society. Oxford: Blackwell. Haila, Y. and O. Järvinen (1990). “Northern conifer forests and their bird species assemblages,” in A. Keast (Ed. ), Biogeography and Ecology of Forest Bird Communities. The Hague: SPB Acad. Publishing, 65-81. Hastings, A. and Harrison, S.: 1994, ‘Metapopulation dynamics and genetics’, Annual Review of Ecology and Systematics 25, 167-188. Pickett, S. T. A. and P. S. White (Eds.) (1985). The Ecology of Natural Disturbance and Patch Dynamics. Orlando, FL: Academic Press. Wootton, J. T. (1994). “The nature and consequences of indirect effects in ecological communities.” Annual Review of Ecology and Systematics 25: 443-466. This entry was posted in environmental studies and tagged apparent_interactions, complexity, ecology, unruly_complexity on December 4, 2010 by Peter J. Taylor. What if everything is already unruly complexity? This leads to Question 2: … implications for whom? but this is embedded in dialogue with diverse social agents to establish significant knowledge & subject to ongoing restructuring. 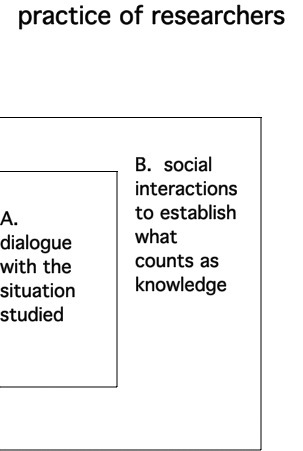 This leads to Question 3: What is the role of the researcher in this dual dialogue? 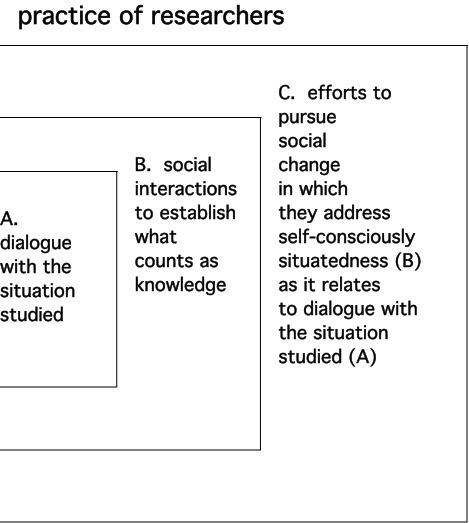 (Notice that, as in the two islands scenario, we have a sequence of 1. simple well-bounded system (researchers in dialogue [using evidence & models] with real world); 2. simple themes, opening things up (researchers are also social beings, so there must be a dialogue with funders, audience, technicians, etc.—indeed, researchers must always already be aware of this); 3. differentiated, locally particular accounts (how the dual dialogue plays out in particular instances—and how researchers could more self-consciously address the dual dialogues). That challenge cannot be addressed alone, nor primarily through our accounts of the world. * Page 203 in Taylor, P.J. (2005) Unruly Complexity: Ecology, Interpretation, Engagement (U. Chicago Press). The book as a whole elaborates the sequence of thinking in these two posts. This entry was posted in environmental studies, Sci&TechStudies(STS) and tagged practice, Sci&TechStudies(STS), situatedness, unruly_complexity on November 10, 2010 by Peter J. Taylor. What if I think that everything is already unruly complexity? What if I think that everything is already unruly complexity? What do I do? Definitions are best accompanied by an illustration. This is provided the case of soil erosion in a mountainous agricultural region in Oaxaca, Mexico. Back to the question. What if everything is already unruly complexity? My first Answer is there’s a Qualitative difference in analysis of causes and in implications drawn from such an analysis. This answer is well illustrated by the two islands scenario regarding population growth. The two islands scenario also illustrates an expository or conceptual theme, namely, the use of simple themes or scenarios that are readily digested but undermine simple, system-like formulations (such as population growth leads to environmental degradation). Instead, these themes or scenarios open up issues, pointing to greater complexity and to further work needed in particular cases (such as the case of soil erosion in a mountainous agricultural region in Oaxaca, Mexico). These “opening-up themes” call for or invite work based on dynamics that develop over time among particular, unequal agents whose actions implicate or span a range of social domains. Back to the question: What if everything is already unruly complexity? and the first Answer that there’s a Qualitative difference in analysis of causes and in implications drawn from such an analysis. This leads to a new Question: Qualitative difference in analysis of causes and implications… for whom? See next post. This entry was posted in environmental studies and tagged inequality, population, unruly_complexity on November 9, 2010 by Peter J. Taylor. Integrating the structure and dynamics of evolution’s ecological context (see previous posts) remains a neglected project within evolutionary theory. Nevertheless, the different approaches to theorizing ecological organization can still be read in terms of the ways that evolutionary theory fits into them, whether or not this is made explicit. Table 1 provides a classification of five basic orientations. Central to the first three orientations is the notion of system, which I use in the strong sense of an entity that has clearly defined boundaries and has coherent internal dynamics, dynamics that govern the system’s responses to external influences and determine its structure, stability and development over time (Taylor 1992). System in this sense can refer not only to the basic units of systems ecology, but also to the guilds and communities of community ecology. These three orientations differ according to the relative time scales of ecological and evolutionary processes. In contrast to viewing ecological organization as system-like, various ecologists have emphasized what I call its “unruly complexity” (Taylor 2005). That is, organisms and processes transgress the boundaries of any unit of ecological structure, spanning levels and scales; natural categories for and reduction of the complexity are elusive; ecological structures are subject to restructuring; control and generalization are difficult. The two non-system orientations differ according to whether this unruly complexity can be disciplined theoretically. Table 1’s distinctions are illustrated in Taylor (2000) through a review of twentieth century theories of ecological organization. In the next post in the series, I note Darwin’s keen awareness of the structure and dynamics of evolution’s ecological context and mention some research that follows in that tradition. Table 1. Five orientations to theorizing ecological organization and evolution. —- “From natural selection to natural construction to disciplining unruly complexity: The challenge of integrating ecology into evolutionary theory,” in R. Singh, K. Krimbas, D. Paul & J. Beatty (eds. ), Thinking About Evolution: Historical, Philosophical and Political Perspectives, Cambridge: Cambridge University Press, 377-393, 2000. —- Unruly Complexity: Ecology, Interpretation, Engagement Chicago: University of Chicago Press, 2005. This entry was posted in biomedicine, environmental studies and tagged community_ecology, evolution, natural_selection, system, systems_ecology, unruly_complexity on September 28, 2010 by Peter J. Taylor.